Bank of America offers several credit cards for personal and business use that can benefit you in many ways. There are cards suited for earning cash back or rewards in various categories such as travel and grocery shopping, as well as cards for financing new purchases or transferring debt — and more. Plus, if you’re a Bank of America Preferred Rewards member, you may be able to enjoy added benefits, which we’ll review in more detail below. 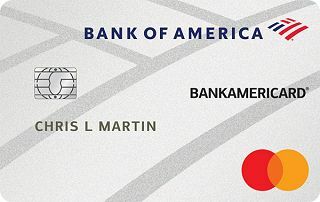 In this roundup, we’ll discuss our top picks for Bank of America credit cards, plus common features that all Bank of America credit cards have. The ability to get out of debt and finance new purchases. There’s a 0% Introductory APR on purchases for 12 billing cycles and 0% Intro APR for 12 billing cycles for any balance transfers made in the first 60 days (after, 16.24% - 26.24% Variable APR). 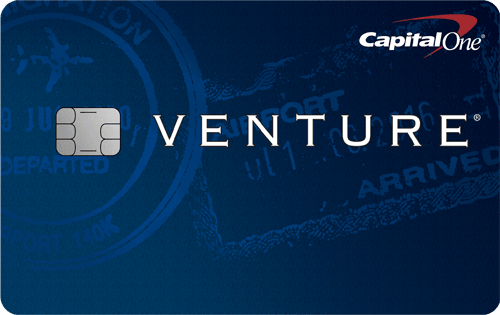 This card can help you save on high-interest charges if you transfer a balance or pay off new purchases over time. Rewards are limited quarterly in the bonus categories. You can earn 3% cash back in your choice category, 2% cash back at grocery stores and wholesale clubs for the first $2,500 in combined choice category/grocery store/wholesale club quarterly purchases & 1% cash back on every purchase. The quarterly limit applies to all purchases in the bonus categories, so big spenders in those categories may not earn the most cash back compared with other gas and grocery cards. But the $2,500 limit per quarter is higher than some other cards that limit bonus categories at $1,500 a quarter. This card is ideal for people who often shop at grocery stores and wholesale clubs and spend on gas. You earn 3% cash back in your choice category, 2% cash back at grocery stores and wholesale clubs for the first $2,500 in combined choice category/grocery store/wholesale club quarterly purchases & 1% cash back on every purchase. Rewards can be redeemed for a statement credit, check, electronic deposit into a Bank of America® checking or savings account, or a contribution to an eligible Cash Management Account® with Merrill Lynch Wealth Management® or Merrill Edge®. 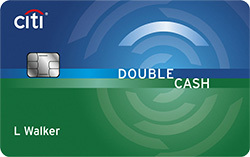 But it’s key to note you can find other cashback cards that earn higher rates for gas and grocery purchases. Simple rewards program. This card offers a simple flat-rate rewards program that does not require activation or involve rotating bonus categories. You simply earn 1.5 points per $1 spent on all purchases. Decent sign-up bonus. This card offers 25,000 online bonus points after you make at least $1,000 in purchases in the first 90 days of account opening - that can be a $250 statement credit toward travel purchases. Slightly below-average rewards rate. You earn 1.5 points per $1 spent on all purchases. 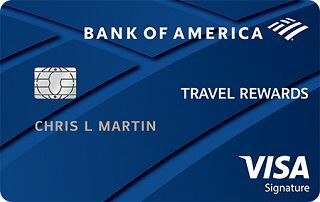 This is just OK compared with other travel cards with higher rewards rates for travel purchases, though they may offer a low one point per dollar on non-travel spending. This card offers a decent flat rate where you can earn 1.5 points per $1 spent on all purchases. You have the flexibility to redeem points for a statement credit to pay for flights, hotels, vacation packages, cruises, rental cars or baggage fees. Other redemption options include gift cards, a check or electronic deposit into a Bank of America® checking or savings account, or a contribution to an eligible Cash Management Account® with Merrill Lynch Wealth Management® or Merrill Edge®. Low $95 annual fee. Compared with other travel cards that have annual fees as high as $550, the $95 annual fee charged by this card is significantly less. Sign-up bonus. 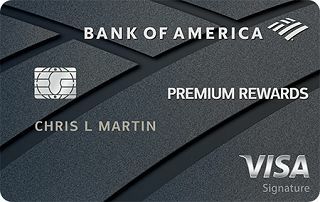 This card has a great offer for new cardmembers — 50,000 bonus points – a $500 value – after you make at least $3,000 in purchases in the first 90 days of account opening. Average rewards program: Cardholders earn 2 points for every $1 spent on travel and dining purchases, 1.5 points per $1 spent on all other purchases. You can easily find cards that offer a consistent 2%, or two points per dollar on all purchases, making the rewards offered by the Bank of America® Premium Rewards® credit card just OK if you’re not a Preferred Rewards member. But, if you are a Preferred Rewards member, you can earn an effective 3.5 points per dollar on travel and dining purchases and 2.6 points on all other purchases. 2 points for every $1 spent on travel and dining purchases, 1.5 points per $1 spent on all other purchases. This rate is good if you typically spend on travel and dining. Points can be redeemed in several ways: statement credit, into an eligible Bank of America® or Merrill Lynch® account (including checking, savings and 529), to purchase travel (air, car and hotel) through the Bank of America® Travel Center, or redeem for gift cards. The ability to get out of debt and finance new purchases. This card offers a 0% Introductory APR on purchases for 18 billing cycles and 0% Intro APR for 18 billing cycles for any balance transfers made in the first 60 days (after, 15.24% - 25.24% Variable APR). If you want to transfer debt from a non-Bank of America credit card or pay off new purchases over time, the intro offers can come in handy and save you money on interest charges — as long as your balance is paid off before the intro periods end. Balance transfer fee: This card has a BT fee of either $10 or 3% of the amount of each transaction, whichever is greater. And while many balance transfer cards have BT fees that may be worth the amount you save on interest, there are cards from other issuers that offer intro $0 balance transfer fees that can save you even more money. 3% cash back on your choice of one of the following six categories: gas stations (default), office supply stores, travel, TV/telecom & wireless, computer services or business consulting services, 2% cash back on dining (for the first $50,000 in combined choice category/dining purchases each calendar year, 1% thereafter) and 1% cash back on all other purchases. The ability to finance new purchases. This card has an intro 0% for 9 billing cycles on purchases (after, 14.49% - 24.49% Variable APR). Compared with other business cards, that’s a good length of time if you are unable to pay off new purchases right away. Great new cardmember offer. Earn a $300 statement credit when you make at least $3,000 in net purchases within 90 days of your account opening. This is one of the best offers for a business card since other cards may require up to $10,000 in spending in a designated timeframe to receive a bonus. Purchases abroad incur a fee. There’s a 3% foreign transaction fee for this card. If you and your employees often travel outside the U.S., you can find other Bank of America cards that are more suited for traveling abroad, such as the Bank of America® Business Advantage Travel Rewards World Mastercard® credit card, which has no foreign transaction fee. Business owners can benefit from 3% cash back on your choice of one of the following six categories: gas stations (default), office supply stores, travel, TV/telecom & wireless, computer services or business consulting services, 2% cash back on dining (for the first $50,000 in combined choice category/dining purchases each calendar year, 1% thereafter) and 1% cash back on all other purchases. This rate is ideal if your business typically clocks a lot of mileage, orders office supplies and goes out for meals. Rewards can be redeemed for a statement credit, check, electronic deposit into a Bank of America® checking or savings account, or a contribution to an eligible Cash Management Account® with Merrill Lynch Wealth Management® or Merrill Edge®. For all Bank of America®-branded consumer credit cards mentioned above (except the Bank of America® Cash Rewards credit card), you can receive a 10% customer bonus if you redeem cash rewards into a Bank of America® checking or savings account or an eligible Cash Management Account® with Merrill Lynch Wealth Management® or Merrill Edge®. And, if you’re a Bank of America Preferred Rewards member, you can increase that bonus to 25% to 75% depending on what tier (Gold, Platinum, Platinum honors) you’re in when you either redeem cash rewards into a Bank of America® checking or savings account or an eligible Cash Management Account® with Merrill Lynch Wealth Management® or Merrill Edge® (applies to cash rewards cards) or make a purchase (applies to points-based rewards cards). 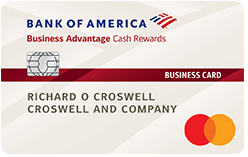 With the Bank of America®-branded business credit cards, there are Business Advantage Relationship Rewards, which offer the same credit card rewards bonuses of 25% to 75%, depending on your balance in the eligible accounts mentioned above. This bonus is a fantastic way to increase the rewards you earn and enhance the credit card offerings. If you don’t meet the balance requirements for Preferred Rewards or Business Advantage Relationship Rewards, you can still receive a 10% customer bonus for all the Bank of America cards mentioned in this post (except the Bank of America® Cash Rewards credit card) as long as you redeem cash rewards into a Bank of America® checking or savings account or an eligible Cash Management Account® with Merrill Lynch Wealth Management® or Merrill Edge®.